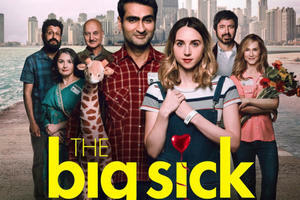 The Big Sick, a cross-culture romantic comedy based on actual events, breaks new ground by casting a brown-skinned Pakistani-American in a lead role in a movie produced and widely screened in the United States. Acquired by Amazon Studios for $12 million after a bidding war at Sundance film festival, the film has already grossed over $25 million so far. “The Big Sick” is based on the life of HBO's "Silicon Valley" star Kumail Nanjiani, 39, who plays himself. A Pakistani American man, a part-time Uber driver struggling to succeed as a stand-up comic in Chicago, Kumail notices a heckler named Emily (Zoe Kazan), during one of his performances. Thus begins a relationship characterized by a series of emotional highs and lows with a lot of laughter in between. Co-written with his wife, Emily V. Gordon, the romantic comedy (romcom) is a somewhat fictionalized account of the first year of their relationship, when a sudden medical crisis forces her to be put in a medically-induced coma for several days. Kumail meets Emily's parents when they come to Chicago to care for their daughter in hospital. After some initial hesitation, Emily's parents (played by Ray Romano and Holly Hunter) hit it off with Kumail. When Emily's father asks Nanjiani what he thought of the 911, the comedian responds: "It was tragic. We lost 19 of our best men" and then smiles, thus breaking the ice between the two. Nanjiani says that "I feel more Pakistani than I have in the last 10 years". "I feel way more defined by my ethnicity now," Nanjiani says. "If there's an ethnicity that is maligned and attacked and demonized ... I'm with you. I stand with you. Because it's unavoidable that people are seeing me a certain way, I kind of want to own it. I feel more Pakistani than I have in the last 10 years", he told USA Today. Kumail has interspersed the movie with a running presentation on his country of birth that shows him singing the first few lines of Pakistan's national anthem out loud. Nanjiani also brings out his love of cricket and the fact that Pakistan has the world's largest contiguous farm irrigation system. While Nanjiani repeatedly acknowledges his Pakistani-American identity, he's less certain about his religious identity. Brought up as a Shia Muslim, he even makes fun of the fact that his people still mourn the killings in the battle of Karbala that occurred 1400 years ago. Kumail tells his father (played by Anupam Kher) that he doesn't know what he believes. The story line of The Big Sick is partly about Nanjiani’s refusal to accept an arranged marriage that his parents wished for him. It is a reasonable position but the way he does so demeans the Pakistani-American women who are introduced to him by his parents. Kumail lacks the courage to tell his parents upfront that he wants no part of an arranged marriage, allowing the Pakistani-American women suitors to suffer the indignity of being paraded in front of him. The movie stereotypes these Pakistani-American women who are forced to speak in fake foreign accents even though they have lived in the US longer than Pakistan-born Kumail has. Overall, it's fun to watch The Big Sick as a ground-breaking cross-culture romantic comedy with a Pakistani-American male lead. Thanks for sharing. Glad the movie is making money. The review was more interesting than the movie which was a real pain to watch for me. In fact, as I walked out of the theater at the end, I distinctly recall thinking that this was the worst movie I ever saw. The comment below is exceptionally telling. It's a two-in-one tribute to the British Raj (and to Macaulay). Ditto for the railroad network. Blame them all you will, Pakistan would be a much lesser country if the British had not ruled over it for 90+ years. A good brief and looks interesting but painting Pakistani-American women the way you have described is something not very appealing , they don't deserve this unrealistic fun made out of them.My opinion. Ahmad: "The comment below is exceptionally telling. It's a two-in-one tribute to the British Raj (and to Macaulay). Ditto for the railroad network. Blame them all you will, Pakistan would be a much lesser country if the British had not ruled over it for 90+ years. " World's largest Irrigation systems..No, it's not. As to Pakistan being a lesser country without the British Raj, one only need look at the socioeconomic indicators such as per capita income and life expectancy that remained static during the British Raj and rose dramatically after independence in 1947, as shown by Swedish Prof Hans Rosliing's Gapminder.org animations. Pakistan would be a much lesser country if the British had not ruled over it for 90+ years. Really! Greater India/South Asia including Pakistan was an Apex civilization for something like 90% of all human history. I think we would have done well if we weren't colonized as Gandhi said'There are no people on earth who would not prefer their own bad government over a good government of a foreign power'. Not that British Raj with famines that cumulatively killed 50 mn + and paupaurized the subcontinent is in any way a good government. This is what happens when you do not have your own higher education boards but follow Cambridge high school curriculum!Basics anyone! I was convinced that I would get a proof on how cricket was invented in the subcontinent and stolen by the British back to England. Ahmad: "I was convinced that I would get a proof on how cricket was invented in the subcontinent and stolen by the British back to England." The Brits stole a lot from India but cricket is not on this list. When the Brits arrived, India under Mughals produced over a quarter of the world GDP, higher than the 22% US produces now. When the Brits left in 1947, India+Pakistan GDP dropped to less than 2% of the world GDP. "Greater India/South Asia including Pakistan was an Apex civilization for something like 90% of all human history." Really? I was reading the list of 10 innovations of India, it included Ludu and snake/ladder board. Thousands of years of history and ludu is one of the biggest inventions? Not sure if you can call that "Apex civilization". Nashra Balagamwala went to RISD instead of participating in an arranged marriage in Pakistan. Now she wants to playfully teach others how to follow her path. At the age of 19, Nashra Balagamwala made the choice to defy her family: Instead of entering into an arranged marriage in Pakistan, she would go to college in the United States. Five years later, with her student visa set to expire, she’s headed home and trying to avoid the still looming marriage by designing a board game. In the game, “Arranged!,” which is funding on Kickstarter, players take the part of a girl trying to creatively avoid a matchmaker and to marry for love instead. Balagamwala hopes to raise enough money through the game that if she’s soon being forced to get married by her family, she can fly out of Pakistan; making a product also makes her eligible for a particular type of U.S. visa. (The O-1 visa for workers with “extraordinary abilities,” which includes a subcategory for artists, could be easier for some people to get than the HB-1 visa, which uses a lottery system; of course, it could be still be hard to get in the current political climate, particularly for a Pakistani Muslim, and a Kickstarter project may not be enough). She’s also hoping that the game can help other young Pakistani women realize they have more options. Each time she returned for visits, she was also scouted by matchmakers hoping to marry her off. But Balagamwala found ways to avoid them–making sure she was seen with male friends, for example, or getting a tan, since darker skin made her seem less desirable in Pakistani culture. In his monologue, this week’s host, Kumail Nanjiani—star of Silicon Valley and The Big Sick—tackled some of the more disturbing cultural trends tied to the racism he’s experienced first-hand. From stand-up comedian to actor, Kumail has already got a few designations under his belt. The Silicon Valley star took it to the next level and carved more than a mark by writing and acting in The Big Sick – a biographical account of his love story with his (now wife) Emily Gordon. He recently appeared on SNL too – and man, what a speech! If that wasn’t enough, he will be starring alongside professional wrestler John Cena in his next venture. What more could you want? Son of veteran Pakistani actor Naeem Tahir, Faran may not be considered a household name yet but he is definitely familiar to millions around the world. You may recognize him as Raza in Iron Man (2008) or Captain Robau in Star Trek (2009). The international artist has been a Hollywood insider for over 25 years now and has guest starred in many TV series and films. His debut appearance was in Disney’s The Jungle Book in 1994 as Mowgli’s father. You can currently watch him in the hit American TV Series Scandal. Named as one of the 100 most influential people in the world by Time magazine, this charmer needs no introduction. She’s earned a couple of Oscars and six Emmys for her work as an activist and film-maker, shedding light on profound issues surrounding women inequality. She is all set to add another feather to her cap as she recently announced her next project, Look But With Love – Pakistan’s very own reality film series directed by herself. You can thank this man for the hysterical one-liners in the Emmy-winning hit series, The Modern Family. The Pakistani-American screenwriter has worked for many big networks including Universal, Nickelodeon and ABC, and is also the recipient of the Writers Guild award for his exceptional writing skills. Sameer is currently writing for his next project, The Goodwin Games. Troublemaker Rebecca Logan in the much-admired TV show Greek, is played by Pakistani actor Dilshad Vadvaria. The Karachi born star was also part of the regular cast of hit TV series, Revenge. Way to go girl! The art installation on the roof of the Metropolitan Museum of Art is always a much-anticipated rite of spring. This year, the Pakistani artist Huma Bhabha has been selected to create a site-specific work for the roof garden, the sixth in a series of commissions for the outdoor space, which will be on view from April 17 through Oct. 28. For the multipart installation, “We Come in Peace,” Ms. Bhabha has “choreographed a dramatic mise en scene” of monumental sculptures, Mr. Jhaveri said. Born in 1962 in Karachi, Ms. Bhabha lives and works in Poughkeepsie, N.Y. Using found materials and everyday detritus, the artist explores themes of colonialism, war and displacement. After having already served as the executive producer of the Nicholas Cage and Elijah Wood starrer – ‘The Trust’ and now with ‘The Terminal’, slated for release in late 2017 starring the incredibly talented Margot Robbie in post-production, Habib Paracha bears the title of the youngest Pakistani Hollywood producer. Habib Paracha is an industrialist, food connoisseur and has most recently added the film producer feather to his cap. Having titled himself a global citizen, Paracha says he is an entrepreneur first. Having his work lauded by many contemporaries in Hollywood, notably his friends James Maslow, Eric Roberts and one of his dear mentors Quincy Jones, Paracha’s journey into filmmaking started off as an experiment and he has been honing it ever since. Having established his footing as a capable and robust new addition to the Hollywood scene, Habib has now set his sights on showcasing Pakistan to his western counterparts. Habib Paracha spends his time between the States and Pakistan and is an alumnus of the esteemed Karachi Grammar School, and Boston University – Habib has most recently launched his new Thai-fusion themed restaurant – ‘Pan Asia’, in Karachi. Aunties, beware — Maria Qamar's got your number. If you think the new wave of South Asian humor is led by men — from The Big Sick's Kumail Nanjiani to Master of None's Aziz Ansari to No Man's Land's Aasif Mandvi — it's time to reckon with women like Qamar. With Trust No Aunty, her new book of Pop Art and satire, the 26-year-old Pakistani Canadian brings the experience of desi girls into the comedy limelight. And if you know Hatecopy, Qamar's Instagram feed, you've already seen her take on the irritation of getting set up with the neighbors' eligible son, or seeing white girls sporting bindis at Coachella. If, on the other hand, you're wondering what "desi" means, Qamar has the answer — along with advice on how to dodge a chappal, shape the perfect roti and cope with the meddling older women in your life. "An aunty is any older woman who thinks she knows what's best for you," Qamar tells me. "She can be someone in your family, or one of their friends, or just someone who lives down the street. My mom's family is huge, so I have a million aunties. They've always got advice, and you think, 'Well, this person is my mom's age, so she must be right. She's helping reinforce tradition.' But some aunties give bad advice, like telling girls to marry at 15 or to bleach their skin. We need to discuss these things in the community. You classify aunties into various types — there's the CEO Aunty, the Bollywood Aunty, and the Aunty in Training. What's your favorite kind of aunty? The Soft Aunty. That's what my mom is. She used to be a Bollywood Aunty. She was always having dramatic reactions to things, and she'd quote dialogue from movies to express her feelings. We kids would be like, "Uh, we saw those movies too — we know where you're getting that from." But now she's more laid back. She's learning to accept things more. And I love her home cooked meals. I love my Mom.